Hangzhou, China, June 29, 2016 – Mars Incorporated, one of the world's largest food manufacturers, today announced an innovative global strategic business partnership with Alibaba Group, the world's largest online and mobile commerce company. Leveraging Alibaba's ecosystem, Mars will establish an integrated online and offline business model to more effectively serve its hundreds of millions of consumers in China. All of Mars' brands in China, including six brands worth over 1 billion US dollars each – Dove®, Snickers®, M&M's®, Extra®, Pedigree® and Royal Canin® – will be available on all Alibaba platforms including Tmall.com and Rural Taobao. 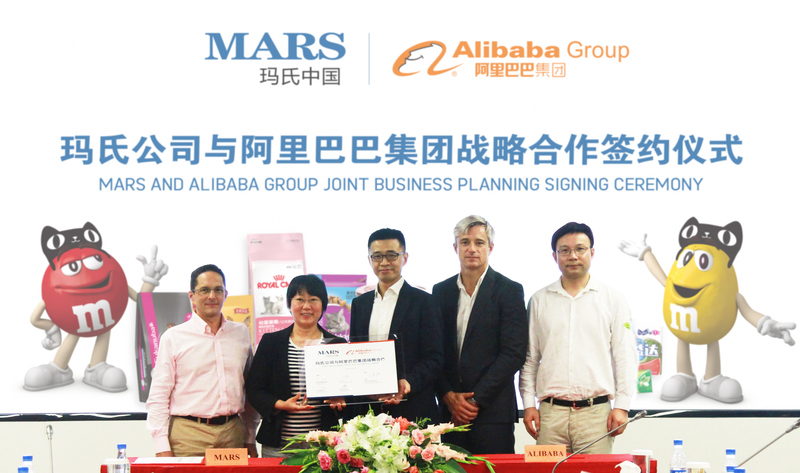 Mars and Alibaba are also partnering to create an e-commerce food safety program that benefits consumers and the broader consumer goods industry, through a collaboration with Mars' Global Food Safety Center (GFSC) in China. Under the partnership, consumers will be able to enjoy a more convenient and international "one-stop" shopping experience. For the first time, all of Mars' brands in China will be available online to consumers in its various Tmall flagship stores and to rural consumers through Rural Taobao. Mars will leverage Alibaba's marketing services, media properties, mobile reach, big data and consumer insights to directly engage with its consumers. Alibaba's supply chain management and logistics network will also help expand Mars' efficiency and reach. Prior to forging this official strategic partnership, many Mars brands have already been very successful on Tmall. In April this year, Snickers® and TFBoys, a popular boy band in China, cooperated on a marketing campaign. In just three days, it achieved almost the whole year's sales of 2015. Based on targeted advertising with Alibaba's big data analysis, the campaign enabled Mars to achieve an ROI which outpaced the average of other brand campaigns in the snack category on Tmall. Royal Canin's flagship Tmall store has sold more than 1,800 tons of cat and dog food since opening, serving more than 50,000 pets across China. Mars is committed to continue leading China's food retail market with its focus on quality and innovation. Moving forward, Mars and its brands will strengthen collaboration with e-commerce platforms around the world like Alibaba to embed internet thinking into product research and development, sales, marketing and other relevant functions. In addition to improving the consumer shopping experience, Mars and Alibaba will also put a focus on food safety through collaborating with the Mars GFSC. The Mars GFSC will work with Alibaba to enhance food safety management, promote consumer education and share the latest scientific research findings with industry stakeholders. The Center is known for its world class scientific research and has supported food safety education for children in China. Through this partnership, it will bring the world's leading food safety management research resources to bear for consumers on Alibaba's platforms. "Mars is an invaluable addition to our ecosystem, and this collaboration is a significant milestone for Alibaba as we now have established close partnerships with three of the world's top food and beverage companies," said Jet Jing, Vice President of Alibaba Group. "We will continue to enable the digital transformation of our partners to help them leverage our ecosystem of marketplaces and infrastructure of support for brand building, customer management, channel expansion and product innovation. Alibaba and Mars share a common commitment to improving safety standards, quality monitoring, and consumer awareness in China. With our combined strengths and resources, we are confident that we can elevate China's consumption model in the era of big data, and deliver greater economic and social benefits to all stakeholders." "China's younger generation is the new driving force of consumption. They rely on e-commerce, and place great value on the trustworthiness of the companies behind their brands and products. Besides our well-known brands, Mars meet their expectations by prioritizing our product quality, and also through our efforts to elevate industry standards," said Cecilia Li, Vice President and Managing Director of Wrigley China, a subsidiary of Mars, Incorporated. "Alibaba is a significant strategic partnership for Mars, as this relationship demonstrates Mars' principles of 'Quality' and 'Mutuality'." In 1911, Frank C. Mars made the first Mars candies in his Tacoma, Washington kitchen and established Mars' first roots as a confectionery company. In the 1920s, Forrest E. Mars, Sr. joined his father in business and together they launched the MILKY WAY® bar. In 1932, Forrest, Sr. moved to the United Kingdom with a dream of building a business based on the objective of creating a "mutuality of benefits for all stakeholders" – this objective serves as the foundation of Mars, Incorporated today. Based in McLean, Virginia, Mars has net sales of more than $33 billion and six business segments including Petcare, Chocolate, Wrigley, Food, Drinks, Symbioscience, and more than 75,000 Associates worldwide that are putting its Principles into action to make a difference for people and the planet through its performance. Currently, Mars has 4 business segments in China, namely Wrigley, Chocolate, Petcare and Drinks, and owns 7 production facilities, 4 R&D centers and 47 branch offices with over 13,000 associates (including contractors). Mars brands in China include: Wrigley - Doublemint® chewing gum and mints, Extra® sugar-free gum, 5 sugar-free chewing gum, Ta Ta® bubble gum, Pim Pom® lollipops, Sugus® chewy candy and Skittles® hard coated chewy candy; Chocolate - Dove®, SNICKERS®, Crispy® and M&M's®; Petcare - WHISKAS®, PEDIGREE® and etc. and ROYAL CANIN® precise nutrition for dogs and cats; Drinks - FLAVIA®,®, ALTERRATM, BRISKTM and Dove®. As one of the world's leading food manufacturers, Mars has driven a new approach to quality and food safety within the business and invested broadly in research, ability and expertise networks to meet the global food safety challenges affecting the food industry. Mars has now built up the Global Food Safety Center to help support the knowledge expansion and understanding of effective global food safety management. The first of its kind for Mars and one of the first facilities of its kind for the region and the industry, the Mars Global Food Safety Center will conduct pre-competitive food safety research and training. Through knowledge capture, knowledge generation and knowledge sharing, the center will raise the bar of food safety management across the industry. We believe that food safety is fundamental to food security throughout the supply chain. And the focus on food safety will help reach our ultimate goal of driving better access, better availability, better nutrition, less waste and will save lives.